It became official this week: in his first game as an NFL player, Mark Sanchez will start at quarterback for the New York Jets. The rookie has the starting job, and Jets fans are excited about the future. Being in the sports hobby business, we’re pretty excited as well: it’s always cool to put product out there for promising rookies (especially one like Sanchez, who is getting the starting job out the gate). But we expect collectors are most excited, especially where rookie cards are concerned. Pretty cool, right? 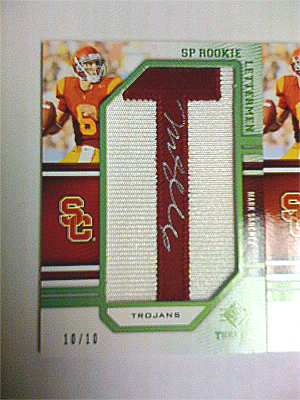 It’s a signed Mark Sanchez USC letterman card, one of only ten (check out the number on the lower left hand side). Seeing as how this card is in SP Threads and hitting shelves on 10/13, I’d say it’s a pretty good brag photo. I get the sense you’re not impressed. I mean it’s a drool-worthy card, but we make these. We’re Upper Deck. We can do better. Yep, that would be the full set. I’m still catching up and everything, but I hear it would be incredibly difficult to put this together. Given that this set has Sanchez’s college threads and he’s preparing to take snaps for the Jets on Week 1, I’d say this will be one of the hottest football cards when it hits the market.